It has been said that all men are born either Aristotelians or Platonists. That is equivalent to saying that there is no debate of an abstract nature that is not an instance of the debate between Aristotle and Plato. The painter Raphael captured this debate with tempera in an immemorial image: in his 1511 School of Athens, the two philosophers constitute the central figures. Plato, old and barefoot, robed in crimson, gestures upwards towards the heaven of the immutable Forms, while Aristotle, in the prime of life, shodden and wearing blue, extends his hand toward the viewer, signifying the doctrine of immanence, or universalia in rebus. Taken together, the vertical orientation of Plato’s gesture and the horizontal one of his student form a cross that represents the intersection of past and future of the Axial Age, and which symbol, by Raphael’s time some twenty centuries later, had achieved its historical culmination as the seal of Christianity. In our time, over five centuries still after Raphael’s composition, Plato’s relationship to spiritual realities may be difficult to comprehend. It is characteristic of the post-modern sentiment, which Friedrich Nietzsche so keenly articulated in Thus Spake Zarathustra with his famous phrase “God is dead” (2), to feel an alienation from these intangible Ideas. Nevertheless, the general disenchantment of our time did not emerge spontaneously, but rather represents an organic evolution of human consciousness through the aeons, whose current one may already discern in the transition of philosophic regency from Plato to Aristotle. 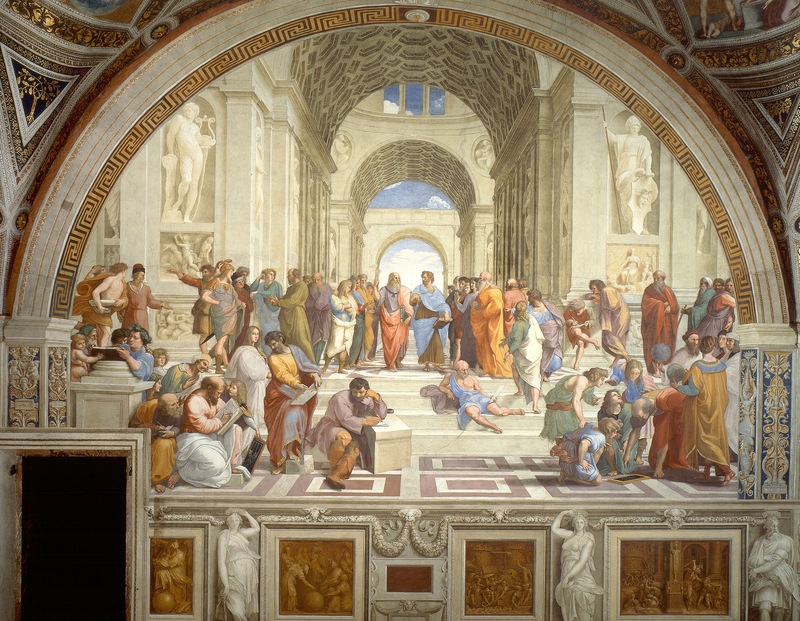 Raphael presents this preëminent pair in School of Athens as straddling two eras: the inherited spiritual tradition to the left, and the new mode of rational and scientific analysis to the right. Above the former poses the figure of Apollo, symbol of illumination by divine wisdom. The Aristotelian school stands under the aegis of Athena, mistress of the rational intellect, an embodiment of the dianoetikon (διανοητικόν). In this manner, Raphael provides a picture of the axial moment in the two masters descending from the Academy. Plato, representing the waning participation mystique of the past—the epoch before humanity’s expulsion from the womb of Nature—wears red to symbolise the fading light of Apollo. 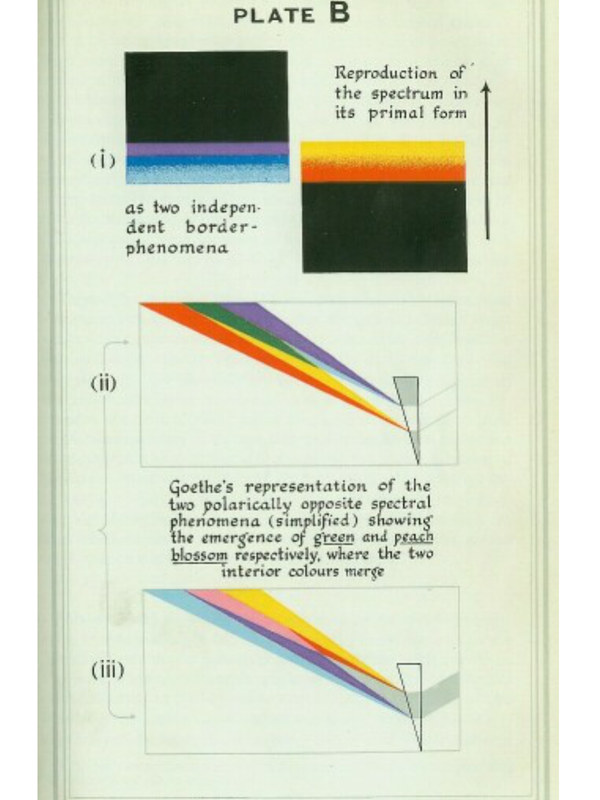 As Johann Von Goethe demonstrated in his work on colour theory, incident light darkened deepens from yellow to red in proportion to the degree of diminution. So in this way, with the intellectualisation of Greek philosophy, the Edenic brilliance of anterior unity was sinking into the distance of prior ages, like a setting sun. The radiant light of Apollo, which at one time transluminated the noösphere in an uniform brilliance, has gradually faded into an evening glow—the incident light now reddened by the accumulating dust of increased ratiocination. The colour of Aristotle’s toga, conversely, points to the future of western consciousness. As Goethe demonstrated, blue is the phenomenon of lightened darkness, manifest in the conditions of light emanating into unrevealed spaces. Thus, the figurehead of the future, which, from the standpoint of the fourth century B.C., remained unrecognised, wears the colour of the unknown. (3) Raphael demonstrates his “negative capability” (4) or “sympathetic imagination” (5) in his perception that, as we today may not fathom the revelations of three centuries hence, nor may we even see past the event-horizon of the coming Presidential election, so for the paragon of the Greek intellectual tradition, “and the lyght shyneth in the darcknes but the darcknes comprehended it not.” (John 1:5, Tyndale version). Aristotle himself characterises transparency as unactualised light. This is to say that space is in potential what light is as the final cause (ἐντελέχεια). (6) Taken in the context of Goethe’s colour theory together with the further line from the John Gospel— “I am the Light of the World” (8:12)—we achieve an ever deeper appreciation for Raphael’s intuitive genius in his choice of blue for the colour of the Aristotle’s robe. Blue is a symbol of vacuity. For Raphael, as for the individual of today, however, the march of history has illuminated what to Aristotle remained in potential but still unconsummated: namely, the incarnation of the solar ego, which we call “Christ.” “The true name of Christ is “I Am,” writes the esoteric polymath Rudolf Steiner In 1909, “who does not know or does not understand this and calls Him by another name does not know anything about Him. ‘I Am’ is His only name.” So before the event that the Steiner called “the essence and meaning of the whole evolution of the Earth” (7), the human being had yet to individuate this light. On a side note of archetypal contextualisation, the sun consistently serves as a symbol of the individuated ego. In astrology, for instance, the Sun represents the sense of self. In the alchemical tradition, the Sun ☉ is linked to metallic gold, which notoriously resists oxidation, which is to say, it preserves its individuality. Immanuel Kant notorious referred to his doctrine of transcendental idealism as the “second Copernican Revolution” in that it replaced the mind’s conformity to objects with the inverse such that the mind attained the central position, just as Copernicus initiated an analogous transition for the physical Sun. In Aristotle’s day, however, this solar spiritual principle shone from without. The newly-emptied human soul thus appeared blue in spirit, and also blue in manifest as in the toga of “il maestro di color che sanno” according to Raphael. With the sacrifice of Christ, the solar principle of individuation entered the human soul and thus radiated from within. Having now presented an artistic and mystical context for the transition from Plato via Aristotle, to the Common Era, we will now attempt to substantiate the claims above by introducing some degree of academicism. In particular we will trace the epistemological implications concomitant with this shift. Before we continue, however, we will just indicate that Raphael depicts the Virgin Mary on many occasions, and that she is dressed consistently in blue and red. In this way, her colours present a symbol of synthesis of the pre-Christian world. 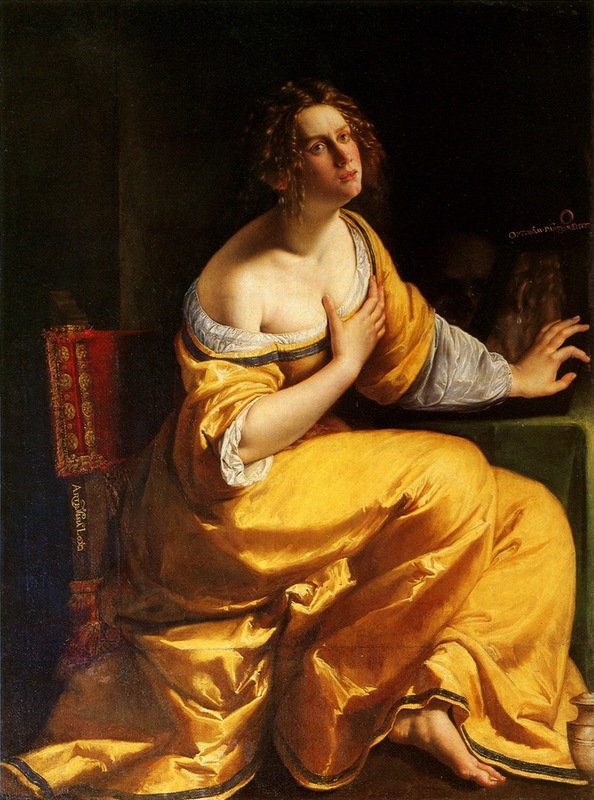 We must turn to the Italian painter Artemisia Gentileschi, however, to find the picture of the post-Golgotha human being permeated with the ego: in his painting of Mary Magdalene from 1616, we find the subject clothed in a dress of irradiant gold. As the first to see Jesus following the Easter miracle of Resurrection, it is fitting that Mary should appear as the herald of the new human condition. From our disenchanted vantage of post-post modernity, it demands an act of true “negative capability” or “sympathetic imagination” on our part to comprehend the experience of the Greek philosophers. Indeed, to the one of today, the pre-Socratic words of Heraclitus “Man does not have insights, Divine has,” or “Hades is Dionysus (8) sound almost as though from a dream. In our ordinary utilitarian, left-brain, beta-wave consciousness, we likely respond with the incredulity of one waking from strange visions, and then gathering our wits, we might remark that such a statement by the Ephesian sage would appear to contradict the laws of formal logic, and that, furthermore, scientific advances have demonstrated that, in any case, gods do not exist and neither does insight except as a subjective epiphenomenon of neurochemical activity. Nevertheless, an ounce of intellectual charity on our part can hardly abide by such dismissal, for just as the Sun at high noon renders invisible innumerable distant celestial bodies, so the individuated ego of the modern human being blinds him to the beings of which such bodies are the phenomenal form. Thus are the subtler workings of psyche and cosmos rendered imperceptible to the modern human. Sing in me, O goddess, of the wrath of Achilles, Peleus’ son. How different nature must have appeared to the Greeks if, as we have to admit, their eyes were blind to blue and green, and instead of the former saw deep brown, instead of the latter yellow (so that they used the same word, for example, to describe the colour of dark hair, that of the cornflower, and that of the southern sea; and again the same word for the colour of the greenest plants and that of the human skin, honey, and yellow resins: it has been shown that their greatest painters reproduced their world using only black, white, red and yellow) how different and how much more like mankind nature must have appeared to them, since in their eyes the coloration of mankind also preponderated in nature and the latter as it were floated in the atmosphere of human coloration! Blue and green dehumanise nature more than anything else does…. It is precisely the former phenomenon that the Ancient Greeks did not experience. The reason is because Nature had yet undergone her disenchantments. Rather, from enchanted surroundings, light radiated towards the Ancient Greeks from all quarters. The crucial point to recognise if we are to grasp the nature of the transition from the pre-Socratics to Plato, and thence to Aristotle, is that the former were themselves part of the very play living Nature, or “physis” (φύσις) as the Greeks most expressively referred to their natural environment. “Physis” has become a shade in our English cognate of the word, for the Greek could not have meant something more different than the kinematic calculus of abstract entities and impersonal forces that modern use of the word “physics” denotes. Physis rather indicated something like “emergence,” “growth,” or “generation.” Even its Latin equivalent, “nature,” retained much of these connotations, as evidenced by the word’s kinship to “nativity” and “natal.” The Pre-Socratic Greeks felt themselves in their own souls to be bearing this generative activity. Aristotle’s school represents a divestment of this content: the soul may elaborate its own thoughts because it is emptied of its prior content. For this reason, Aristotle, one of the greatest thinkers of history, appears in blue on the steps of the Academy. Though to him, Nature likely still emanated living divine warmth and light, the human soul was no longer the immediate participant of it. Indeed, the spiritual sun of participation general had set with Plato and withdrawn from the human soul, inwardly to rise again some three-odd centuries later in an individuated form. We will now definitively shift our consideration towards the epistemological aspect of this transition. If we adopt the year zero as a reference point, we may imagine concentric ripples emanating through the noösphere over many centuries. The medieval Scholastics, from the crest of one of these billows, strove in retrospect to descry the nature of this development, and it was from this tradition that we inherit the most lucid characterisation of the “dialogue between these eternal antagonists,” as Borges described the conflict between Plato and Aristotle in the quote above. Universalia ante res—literally, “universal before things”—was the Scholastic term for the Platonic doctrine that ascribed both precedence and presidency to the ideal essence, (“ousia” ουσία or eidos είδος) of a given object. Thus, to help a grandmother across a busy intersection can be called “good” precisely because the act has partaken of the Form of the Good. In contradistinction to the Platonic school, Aristotle posited that the Form of the Good is immanent in all of its instantiations and not transcendent to them. Thus, we learn about the Good by observing, among other things, charity towards the kinetically disadvantaged in the face of imminent danger. Nevertheless, if people ceased to perform beneficent actions, the Good would die with their goodness. Philosophers and theologians of the Middle Ages called Aristotle’s conception universalia in rebus—“universal in things.” A third conception also found foundation and formulation by the Scholastic. This view stood the Platonic doctrine on its head and declared “universalia post res”—“universal after things.” William of Ockham was amongst the first to articulate this view, which is known as Nominalism. (12) In contrast to Realism, which holds that essences exist, the Nominalist position asserts that the latter are mere mental abstractions formed post factum according to intellectual categories. Thus, it happens that one aids an ailing grandmother, and we happen to call it “good” by sheer convention according to its abstract association with other charitable deeds. We might contrast Realism and Nominalism by describing the former’s virtue as one of “self-difference” and the latter’s as “self-similarity.” This is to say that Realists conceive of principle unity differentiating itself, while Nominalists claim that a synthesising activity of the intellect artificially links differences according to qualitative similarity. To picture the distinction, we may respectively imagine a geometric figure divided five ways and contrast this to five different geometric figures. In the former case, the single figure is primary and each section remains in implicate relation to the whole. In the latter case by contrast, difference is primary and the hypothetical quintet forms only according to a synthetic activity of the intellect. Plato exemplified the process of cognition through “self-difference” just as the Nominalists exemplified that of “self-similarity.” Still recognising Universals but nevertheless relegating them to particular instances, Aristotle, A’s is so often the case, represents an intermediary in this conception. We may now gain a perspective of this metamorphosis. This reveals a transition “down through the centuries and latitudes, the names…the dialects, the faces” of universal to particular. If we were to trace this transition back from Plato into the mists of pre-history, we may assert with intuitive confidence that all was universal. In pictorial form, we may imagine that before tasting of the proverbial Fruit, humankind lacked Knowledge of Good and Evil, which is to say, duality. In the most essential sense, this is an expression of the basic epistemic cleft at the heart of the modern human condition: the distinction between subject and object. We may imagine, however, a time before the latter had first entered into cognition. In this sense, individual human consciousness having not yet been born from the womb of Nature, the universe was itself a single universal—between lógos, cosmos, and psyche there was not the slightest difference. If we swing forward to the opposite pole of this ideological-historical spectrum to the disenchanted world of post-modernity, we are met with quite the opposite picture. We find an ultra-relativism as the highest ideal and no single universe at all, but rather a pluriverse of variegated opinions. Every individual has his or her or zir standpoint whence one measures the issues of the day, and universals are taken to be intellectual abstractions wrought according to one’s particular cultural context and paradigm. Where we arrived at the former pole by moving past Platonism and the pre-Socraticism into pre-history, we arrive at our contemporary worldview having passed through Islamic Aristotelianism, Catholic Aristotelianism, Scholastic Nominalism, Protestantism, British Empiricism, European Enlightenment thought, and British Utilitarian Economic Liberalism, to mention several definitive waypoints in this journey. In the latter transition we can discern a trend that we may characterise in two ways: as a disenchantment of the natural world in respect to universals, and as a diminution of universals in respect to their ontological robustness. To deepen our understanding of this metamorphosis, we may draw on the picture provided by the archetypal processes of Salt, Sulphur, and Mercury from the alchemical tradition of the Renaissance, as Paracelsus articulated it in particular (13). Paracelsus explains these three principles in his 1530 work Opus Paramirum when he recommends one to “[take] a piece of wood. It is body. Now burn it. The flammable part is the Sulphur, the smoke is the Mercury, and the ash the Salt.” In archetypal terms, salt and Sulphur represent polar processes of aggregation or formation and combustion or dissolution respectively, while Mercury represents the fluidic intermediary or balance. In this sense, we may imagine that the Salt process characterised the time before the Common Era in so far as spirit and matter, or universalia et res, tended towards cohesion. The trajectory of the Common Era, by contrast, has been one of preponderating Sulphur. In this process, matter and spirit undergo a sustained separation whose inevitable conclusion is scorched Earth, or “ash,” to use alchemical terminology. As Joseph Campbell observed in an unforgettable interview with Bill Moyers in 1988, “The world without spirit is a wasteland” (14). Inwardly, this wasteland appears as existential malaise and outwardly as the fumes from a trillion tons of fossil fuel and a planetary greenhouse effect. Indeed, while the Salt process was behind the photosynthetic generation that first bound the ancient sunlight into organic substance, Sulphur is behind the fire that now burns away these forests and fossilised fuels, liberating the light, the warmth, the spirit that was erstwhile enchanted into organic matter by means of hydrogen bonds. Given the extremity of the process the alchemists call “Sulphur,” the Scholastics call “Nominalism,” Anthroposophists call “Materialism,” and Charles Taylor calls “disenchantment,” facts now appear so alien from values—statistics from moral action—that we no longer experience the identity of these two desolate consequences and are rendered morally impotent therefore while we drive the Earth towards ecological catastrophe. Now having oscillated in our consideration between the two poles of Salt and Sulphur and their historical expressions in pre-history and post-modernity respectively, we may now finally turn to the balance point between them. The former we may conceive of as a spiritual principle that also incarnated onto the stage of history and became “mystical fact” (15) thus representing the healing of the rift between them. In the terms of Paracelsian alchemy, we must call this principle “Mercury,” while in history we call it “the Incarnation of the Christ.” In both cases, we refer to an archetypal virtue of salvation. We need not rely on the specious conflation of the caduceus with the rod of Asclepius to connect Mercury and Christ, for this connection emerges organically from a consideration of their shared project to heal rifts and reconcile opposites. Still, we can find some historical link: Homer, for example, writes of “Hermes the healer” (13), and the Olympian plays the essential role of messenger and intermediary between gods and mortals. 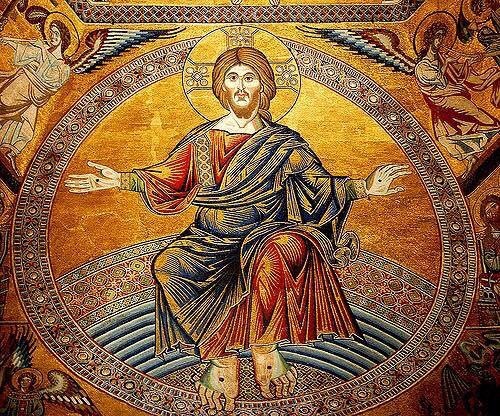 The figure of Jesus Christ likewise represents a principle of messenger and intermediary: Jesus as a human being exalted and the Christ as a divine being descended—the former pictured in the scene of Transfiguration and the latter in the descent of the dove at Baptism in the River Jordan. “He was made man that we might be made God,” as Saint Athanasius famously expounded in the 4th century. (17) As for Mercury the go-between, Christ’s reciprocity and conjugation also manifests in healing virtue: in the John Gospel, for instance, we find Christ pose the question to a sick man: “Wilt thou be made whole?” When the man begins to offer Jesus a plaintive litany to rationalise his state, Jesus interrupts him: “Rise, take up thy bed and walk. And immediately the man was made whole, and took up his bed, and walked” (5:6-8). Thus, while Plato experienced something of the ancient identification with this transcendental light, for his pupil, the coextension of human being with the universal spirit that was the source of his teacher’s inspiration had largely ceased. Instead, Aristotle’s interest was called by the spiritual light still extant in Nature. This extraverted orientation remains the inheritance of Western culture today, though the universalia in rebus that Aristotle sought have now even withdrawn from the world as it appears to human senses and now approaches human experience from within. Given the riveted extroversion of our attention, however, we fail to recognise the spiritual reality of these universals budding within the human spirit, which appear as though “…through a glass, darkly,” as Saint Paul famously described this condition. (21) This is to say that we perceive mere appearances, whose meanings we immediately subvert into measures of instrumental value. It is out of this vacant utilitarian consciousnesses that we derive Nominalistic doctrines of abstraction and disenchantment. We furthermore find ourselves entirely bereft of the capacity to perceive the ontological primacy of the whole—the primacy of the Word—and therefore compulsively fall into reductionistic tendencies and assume atomism and meaninglessness as axiomatic starting points of our sciences. The truth is that human beings are not separate from the world they wish to comprehend, and that the same world depends for its growth on their spiritual pollination. As cherry-blossoms charm the buzzing palmers out of hibernation by the light and fragrance of their gentle beauty, so the world enjoins the human being to awaken from her materialistic slumber that she may fulfill her role as honeybee of the invisible. Originally published in October 2016 on the Lizard-press, which is to Theoria-press as Zeus is to Athena. 6 Aristotle. De Anima, Book II 419a 10-12. A lecture delivered in Manchester College Chapel, Oxford, on August 27th. 1922. Authorized translation from the German of Notes unrevised by the lecturer. Published by kind permission of Frau Marie Steiner. 13 Paracelsus, Essential Readings, ed. Nicholas Goodrick-Clarke (Berkeley, California: North Atlantic Books), 76. 15 Rudolf Steiner. Christianity as Mystical Fact. Rudolf Steiner Publications, Inc.
West Nyack, New York Copyright 1961 by Rudolf Steiner Publications, Inc. THE CONTRASTING WORLD-CONCEPTIONS OF EAST and WEST. Lecture by Dr. R u d o l f S t e i n e r. Delivered at D o r n a c h, 17th of June, 1922. 22 Charles Taylor. A Secular Age. Boston: Harvard University Press, 2007. Next Post Where do laps go when people stand up?